The country is England, the sport is "Conger Cuddling," and the athlete pictured here is pointing his ... wait a minute ... no! His eel! He's preparing to toss an eel! You people are disgusting sometimes. A charity skittles game — in which humans are the pins and the ball is a dead conger eel tied to a rope — has been banned after animal rights activists complained that it was disrespectful to eels. 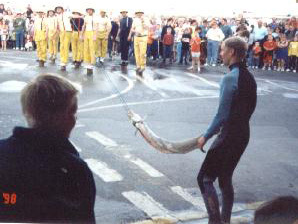 During the event, a number of people stand on blocks of wood and have to dodge a 150cm/5' long Conger eel, swinging at them on a rope.  The team who has the most members still on their flowerpots at the end of the game wins. Like we had to explain the rules to you. Evidently this is a trend, as it appears now to be illegal to chuck an eel throughout most of Europe. Yet in Russia, they are still allowed to do this. (And yes, we know this story is a bit old. Eel news from Europe typically takes longer to get to us than regular news). After the jump, a related activity which is, to our knowledge, still completely legal everywhere.